I have never been a fan of ‘sales systems’ because the world simply is not full of round holes waiting for round pegs. Selling is a subtle skill and the best salespeople instantly read the situation and use the best fitting sales approach. Why do salespeople feel the absolute necessity to take me through their sales process when I know what I want – just let me buy! A sales system is a decision to follow a particular path and solution selling needs to find the pain and to fix what is wrong. The problem with solution selling approach is that often there is nothing wrong. What happens to your solution based sales approach when nothing is wrong? The reality is that most of the time we have only one shot at a prospect. If we get it wrong we have lost the opportunity. What prospect will sit there while we try every sales approach in the book until we spark an interest? The best sales approach never attempts to solve a problem! The best sales approach changes perspective. Steve Jobs never tried to ‘find our pain’ and then sell a solution. When the first imac hit the market all personal computers were big grey boxes that sat on a desk or black, boring notebooks and we were happy! It was not until I saw the first Blueberry imac that I knew that I wanted one. The same was true later for the iphone and the ipad. I was happy with my Blackberry Smartphone until I tried an iphone. There was no solution because there was no problem. The very best salespeople never sell solutions to problems, they sell opportunity because opportunity is passion, it is realization, it is a change in perspective and it is life changing! When we adopt a selling strategy, such as solution selling, we are pre-filtering our prospects to those who have a problem. We are looking for people who are unhappy with the provider of whatever product or service we deliver. When we take the ‘we are a better choice’ approach it is critically dependent on our prospects being unhappy and it requires that we compare ourselves to the current provider. It is much more effective to sell ‘different’ than to sell ‘better’. When we sell ‘better’ we enter the competitive field and invite our prospects to scrutinize us against the current choice. When we sell ‘different’ we are selling our passion – the unique future that is possible. We do not ask people to pick the best apple amongst many apples – instead we ask them to try a pineapple! 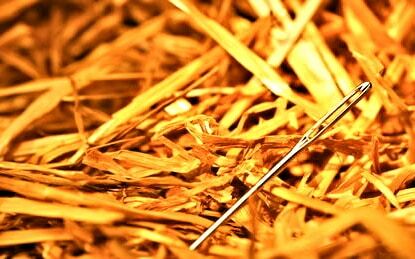 Be the needle not the haystack! Does solution selling ever make sense? No, not really! Even when a prospect comes to us unhappy with the current choice, the moment we start to offer a ‘better solution’ we begin to compare ourselves. The moment that happens we are inviting further comparison and further selling challenges. Sell your dream not your solution. Get passionate about your business and intelligently change the conversation from ‘better’ to ‘different’. Ask your prospects to forget the old choices and consider a new path!